Storing breast milk is a great way to continue breastfeeding even when mom is not physically in the same location as the baby. As great as breastfeeding can be, there are times when it’s seemingly not always possible. Premie babies may not always be able to breast feed directly at the breast. How can mom breast feed a premature baby? Sometimes mom makes way too much milk resulting in an overflow. What to do with all the extra milk? Feeding a baby every 2-3 hours leaves little time for mom to sleep or rest. When will she ever be able to take even a small nap? And let’s not forget about Dad! While this is a bonding experience for mom and baby, feeding time can also be a great bonding time for dad and baby as well. When or how will he have a chance to do that? What about when mom goes back to work…how will she breast feed when she is at work and the baby is at another location with a caretaker? Does this mean she has to stop breastfeeding when she starts working again? Does life have to stop? Absolutely not! Simple solution – just store the milk! 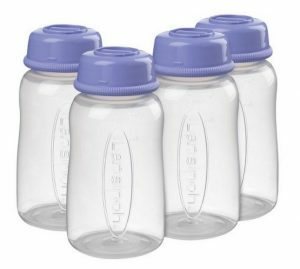 Storing breast milk is easy and a very smart way of continuing the breast feeding experience even if baby and mom are not in the same geographical location. It is also a great way to give mom a much deserved (and needed) break and let dad or another family member or friend help out feeding the baby. There are many ways to express the milk from the breast and then store it for later use. Just keep in mind that just like preparing any other food, your hands must be washed and clean and the bottles/containers in which you will be storing the milk must be sterilized and clean as well. Human milk can be frozen for a few weeks, refrigerated for a few days or kept at room temperature for a couple of hours. Place milk inside of a clean sterilized container, bottle with a cap. You can also use a heavy duty plastic bag made specifically for nursing bottles. Try not to use regular plastic storage bags. They can leak may collect the “taste” of whatever else you have stored in the freezer at the time. Freezing the milk in a regular freezer compartment means 2 weeks is the max storage time. If you are storing it inside of a freezer that is part of a fridge but has separate doors then you can freeze it for 3-6 months. If you are storing the milk in a standalone freezer you can go 6-12 months of storage. When you are ready to use the milk and begin to thaw it, be sure to thaw it in the fridge (allow yourself some time for it to thaw completely). Alternately you can take some warm water and thaw it . Do not use a microwave because it will not heat up the liquid evenly and you can end up burning your baby’s lips and mouth. Always wash your hands before you handle the milk or the containers/bottles you will be putting the milk inside. Do not add fresh milk to breast milk that is frozen. Also never save milk from one feeding and reuse at a later time. Finally, be sure to label the milk and the date it was put in storage. If the milk will be going to a caretaker or babysitter, label the milk with the baby’s name as well. Keep up to date with the latest woman’s health and pregnancy news on our blog. Click here to see more.